They were kind enough to send my daughter, Arianna the Ooh La La Body Lotions (don't you just love the name?) in Strawberry Parfait and Glamorous Grape, and WOW did she love them! She instantly went crazy slathering them on and fell in love with their Strawberry Parfait lotion telling me it smelled like "yummy strawberries and creeeam". Not only do they smell scrumptious but their packaging is just a sweet and their smell! The Shimmering Body Powder is just as adorable. It smells utterly delightful and comes with it's own fluffy powder puff (what little girl wouldn't love that?). The powder itself has glitter in it which your little ones will love because it makes them sparkle. But Moms you might want to be careful with this one--the powder can get a little messy. Overall, I think they're great products that will make all little girls feel just as Glamorous as Fancy Nancy! Right now they're offering my readers a 15% off any order of $20 or more by simply using the Coupon Code: SAVE-15. You might also want to take advantage of the free shipping offer for anything over $35. 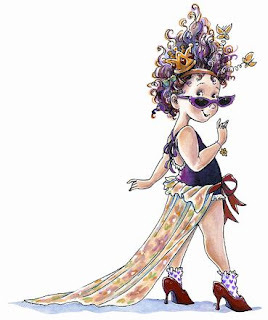 I love fancy nancy she is so cute. I feel like you always have the best stuff love love love this blog.